What I like most is that Meadowmont is a walkable neighborhood just 3 miles from the center of town in Chapel Hill. Meadowmont Village has it’s own commercial area designed like a tiny main street. There is a fitness Center in the community as well as a Harris Teeter grocery. Meadowmont is located at the HWY 54 entrance to Chapel Hill just a couple of miles from UNC and a couple of miles from I-40. The neighborhood is approximately 450 acres including a commercial area, homes, town homes,condos and apartments along with the Cedars, a continuing care community. Rashkis Elementary school is in the neighborhood. Meadowmont is all about convenience. Residents love to walk to shopping restaurants and to school. The UNC Wellness Center is located in Meadowmont and is a wonderful facility. 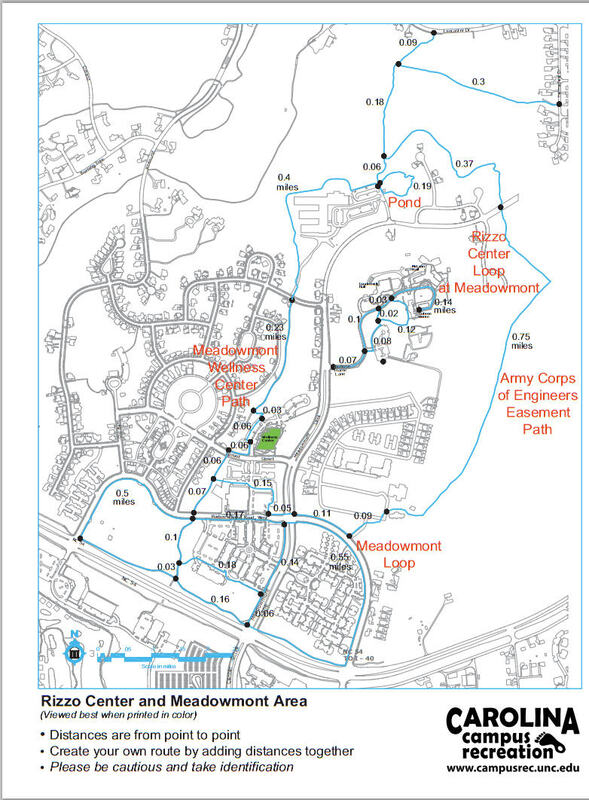 The Wellness Center put out an excellent map of the trails and distances around Meadowmont.